The two main holders of United States Treasuries, the countries of China and Japan, have dumped the dollar. Both nations have dramatically cut their ownership of notes and bonds in August, according to the latest figures from the US Treasury Department, released on Tuesday. It appears that a dollar crash could be imminent, as no one wants to buy American debt anymore. Earlier this week, Goldman Sachs said that the United States’ policy of sanctions and tariffs against major economies, including Russia, China, and Iran, have dragged down the dollar’s share of global central-bank reserves. 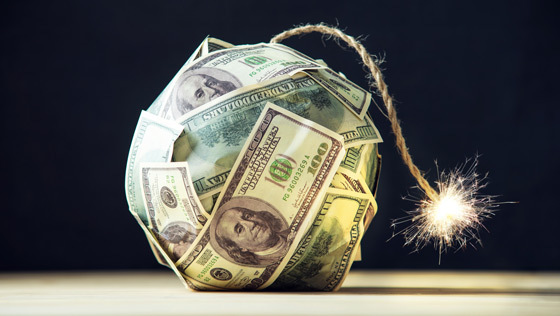 Meanwhile, the data from the International Monetary Fund confirms that the US dollar’s share in the global central-bank reserves dropped to 62.3 percent from April to June. Meanwhile, holdings in the euro, yen, and yuan gained as a share of allocated reserves. According to a report by RT, China’s holdings of U.S. sovereign debt dropped to $1.165 trillion in August, from $1.171 trillion in July, marking the third consecutive month of declines. China, the world’s second-largest economy, has been bolstering its national currency amid an ongoing trade war with the U.S. China still remains the biggest foreign holder of US Treasuries, however, followed by long-time US ally Japan. That could all change though should the country continue to dump the dollar. Tokyo also cut its holdings of U.S. securities to $1.029 trillion in August, the lowest since October 2011. In July, Japan’s holdings were at $1.035 trillion. According to the latest figures from the country’s Ministry of Finance, Japanese investors opted to buy British debt in August, selling US and German bonds. Japan reportedly liquidated a net $5.6 billion worth of debt. Iran has also said the dollar has no place in their transactions while Turkey and India have followed Russia’s footsteps. Turkey has dropped out of the top-30 list of holders of American debt following a conflict with Washington over the attempted military coup in the country two years ago. While India remains among the top-30, the country has cut its US Treasury holdings for the fifth consecutive month, from $157 billion in March to $140 billion in August, according to RT. This article was posted in "US debt", China, Currency, dollar crisis, drop dollar, dump dollar, economic distress, Headline News, Holding, Iran, lowest holdings, Russia, Sanctions, tariffs, Treasury Department, United States, US securities, us treasuries and tagged goldman sachs, turkey. Bookmark the permalink. Follow comments with the RSS feed for this post.Comments are closed, but you can leave a trackback: Trackback URL.